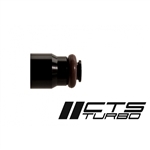 CTS is proud to release our 12mm fuel injector extensions. These are particularly popular when extending the EV14 48mm injectors to a more standard 60mm length. 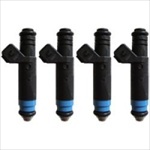 Black anodized finish These 60lb(630cc@3bar) injectors are a very popular choice for turbo applications. Another popular choice for turbo applications, these high-impedance fuel injectors flow 52 lbs/hr @ 3bar, and more at higher fuel pressure. A popular choice for BT 1.8T/24v/R32 turbo applications, these high-impedance injectors flow 80lbs/hr @ 3bar, and more at higher pressure. A popular choice for turbo applications, especially 12V VR6T/2.0T ABAs. 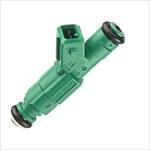 These high-impedance injectors flow 43lb/hr @ 3bar, and more at higher pressures. 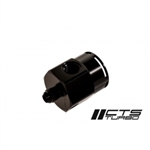 CTS is proud to release our Billet Fuel Pressure Regulator (FPR) Housing for OE VW/Audi fuel pressure regulators. This FPR housing can be mounted to the end of your rail, or mounted remotely. The inlet connection and dual outlet connections are -6AN. Choice of -6AN, -8AN, -10AN or -12AN inlet/outlet Fuelab Filter with short (3 inch) 10 micron / Paper Element (Cellulose) - The most economical and commonly used element. Item-detailsFUELAB� In-Line Fuel Filters keep your engine running clean. They feature male AN / 37� Flared fitting end caps, so you can attach them directly to other fuel system components. Also featured are machined internal radii for minimal pressure drop. The compact 818 Series Fuel Filter includes a 3 inch element. With AN female ports. O-ring required. Consult component manufacturer�s port specifications. Includes 10 micron / Paper Element (Cellulose) - The most economical and commonly used element. It is disposable yet provides excellent filtration. Compatible with Gasoline and Diesel only. 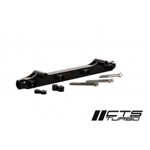 CTS is proud to present our new 1.8T 20V fuel rail for Audi and VW applications. 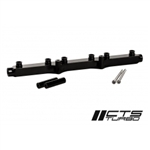 Machined in-house from solid T6061 aluminum, this fuel rail is a must for any VR6 owner who is after serious power. Machined from billet T6061 aluminum. -8ORB ports for easy installation. Mounting bolts and spacers are included. Logo orientation for VW and Audi specifically, please choose from dropdown menu. On AMB engines with short injectors, 12mm injector extensions must be used. Part number CTS-HW-0149. 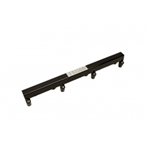 CTS is proud to present our new 12V VR6 fuel rail. Compatible with most Short Runner Intake manifolds only. These are the billet aluminum Bosch 044 mounting plates that we use for our dual 044 surge tanks. We are now selling them separately for anyone looking to build their own custom fuel cell or surge tank. This will take care of mounting the pumps for your custom fuel project! It can be welded to any tank of your liking. These are made in house on our CNC mill, to ensure perfect quality. They feature 3- #6AN o-ring ports for plumbing the tank. �12-month comprehensive warranty This is an innovative surge tank design brought to you by Integrated Engineering. A surge tank is essential to provide fueling for very large fuel pumps on street cars, where effective scavenging is a must, and a fuel cell is not possible. Surge tanks work by filling up with fuel from the OEM in tank pump. The large fuel pumps draw from this reservoir. Fuel is only returned to the main tank when the surge tank is 100% full, thus providing a steady supply of fuel. Traditionally, the surge tank is just a can with various inputs and outputs for fuel. We stepped that up a level, because we wanted to solve 2 problems at once. This tank houses a pair of the mighty Bosch "044" pump over 75% inside the tank, using the fuel to muffle the noisey pumps. It also cools the pumps in this manner for extra reliability. This is accomplished via a carefully engineered, CNC machined front cover plate. This machined front cover accepts the Bosch pumps with an O ring seals. It also provides 3 x -6 O Ring Boss inputs / outputs for your plumbing, providing a leak proof seal without any nasty pipe threads. The back of this plate is fully pocketed out to remove excess weight. A red anodized / cnc machined clamp plate is included which retains the pump in place.